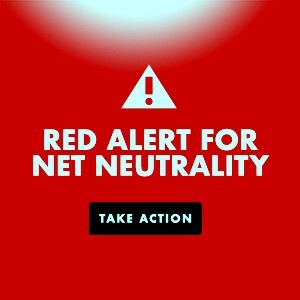 There are two reasons why it’s important to stop talking like this: 1) Because it’s not true, and 2) Because it perpetuates an ideology of how money and public financing work that is not only false, but profoundly reactionary and politically damaging—that is designed to, and will, impede achieving the most basic progressive goals. Let’s deal with the second point first, since I know a lot of leftists won’t overcome their resistance to understanding and promoting an economic proposition that runs counter to the common wisdom unless they can see the political point of it. If that’s true, we are then in a polity where those who pay more dollars in taxes have a prima facie credible claim to demand more influence on the use of those dollars by the public authority—i.e., more political power. After all, the government depends on them; they are its donors, the breadwinners of this household, the source of its wealth. In a taxpayer/donor-financed polity, you can debate whether “taxation is theft” and to what extent “winners”—i.e., meritorious taxpayers—are paying for “losers” and “moochers”—i.e., “undeserving” non-taxpayers. It’s a polity where social programs of universal benefit exist at the sufferance—whether forced or voluntary—of the wealthy, subject to constant negotiation about how far that should go. Let’s start with the Democratic Party. It’s not the left, I know, but it is the legislative horde that left activists must corral and entame to get programs like Medicare-for-all. 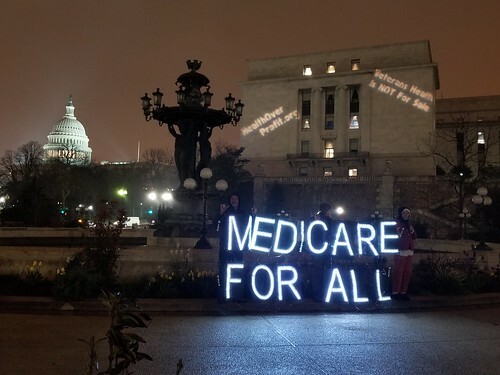 And, pressured by its angry constituents and the bevy of self-identified “socialists” who have recently joined it, the party has even, however squeamishly, agreed to accommodate the “Medicare-for-all” demand. “Republicans have made clear time and time again that they don’t care about the deficit. And Democrats shouldn’t either. Rather than fixating on the GOP’s shaky math, Democrats should highlight the cruelty of shoveling money to the rich at a time when inequality is soaring and millions languish in poverty…. The Republicans always preached balanced budgets. But, starting with Carter and cemented with Bill Clinton, the Democrats decided to win for themselves the title of “the party of fiscal responsibility.” As Bill said: “I hope you’re all aware we’re all Eisenhower Republicans… We’re Eisenhower Republicans here, and we are fighting the Reagan Republicans. We stand for lower deficits and free trade and the bond market. Isn’t that great?” Clintonism explicitly turned the Democrats into the second Republican Party. His bill establishes—”create[s] on the books of the Treasury of the United States”—a “Universal Medicare Trust Fund” that replaces the current Medicare Trust Funds, and would presumably receive all the new taxes. But, again, that Fund “shall consist of such gifts and bequests as may be made and such amounts as may be deposited in, or appropriated to, such Trust Fund as provided in this Act, including “Notwithstanding any other provision of law, there are hereby appropriated to the Trust Fund for each fiscal year … amounts that would otherwise have been appropriated to carry out the following programs:” So, whatever taxes are paid to the Trust Funds, and whatever else the law says, we’ll appropriate what we need every year to carry out the program. This is a futile and losing game. Futile, because, in reality, nobody knows what a Medicare-for-all program will cost. That’s unknowable precisely because the federal government will constitute a monopsony—a single buyer of health services that will dominate the market and radically change the price structure. Swatting imaginary numbers back and forth is beside the point. There’s no discussion like this about defense appropriations. An $80 billion increase in military spending, and nary a “how are you going to pay for it” peep from the all the Serious People. You won’t find any purportedly earmarked taxes in a defense bill. All you’ll find is: “the following sums are appropriated.” That’s how it’s “paid for,” no questions asked. But if we’re not going to stand on their ground, we have to stand somewhere else. We have to realize that the bedrock of their ground is the proposition that taxes fund government spending, that the federal government must get money from taxpayers—per Maggie, the money “people themselves earn”—to pay for any government program. The Medicare-for-all battle should make it clear: If you are going to get out of this trap, you have to get out of the “taxes fund spending” paradigm. 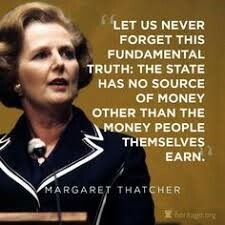 You’re either with Thatcher, or you’re somewhere else. You either think what she said is true, or you think something else is true. You’ve got to find another rock to stand on. 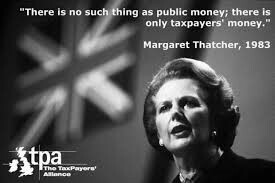 The idea the government needs to collect tax revenue (or revenue of any kind) to spend is a vestige of an obsolete currency system, more archaic even than Maggie. As the sole currency issuer, the US government can, and does, create as many as dollars as it wants, without “collecting” any dollars in advance from any source. And a “tax dollar” does not go to fund government spending; it cancels out a debt, turns a -1 in the government’s ledger into a 0. You can’t spend a 0. I certainly think leftists should support high progressive income tax rates, estate taxes, etc., but not because we need them to fund Medicare-for-all. If you argue for higher taxes for that reason, or if you object to tax cuts for the wealthy because they increase the deficit, you have ensnared yourself in the trap. The reason to object to tax cuts for the wealthy is because they’re for the wealthy, because they increase inequality—not because we need the money for healthcare or because they increase the deficit. We need to re-configure both spending and tax policies for progressive goals, based on a correct understanding of how our money system works. If we don’t, the right will continue to configure them to reactionary ends. This entry was posted in Capitalism, Democrats, Economy, Health Care, Republicans, Socialism and tagged Debt, Inequality, Jim Kavanagh, Margaret Thatcher, MMT, Monetary Reform, Neoliberalism, Single Payer, Very Important or Must-Read Posts. Bookmark the permalink. refreshing to read this analysis, as “welfarism” was/is essentially a tool invented by Beveridge /FDR etc to buy off social revolution. The distinction between “social democrats” and “democratic socialists” must not be blurred, and is fairly simple to explain , as done so here. Only what was called “conscientisation” (awareness of this distinction) can bring the empowerment which may lead to the replacement of the corporatist state .Realistically, I think the chances of any wide “conscientisation” are threatened by the huge “bread and circuses” appeal of welfarism and militarism but also by the increasing invasion of daily life by technologies which effectively work against constructive critical thinking. thank you for the article. Thanks for your comment, David and thank you for reading the article. Good points.